When it comes to playing a game – any game – nothing is more important than foot comfort. When you are running like a maniac after a ball, it’s nice to know that if you were to fall, it would be because of your own clumsiness – and not because your shoes were not able to keep up with you. This goes double when it comes to children. 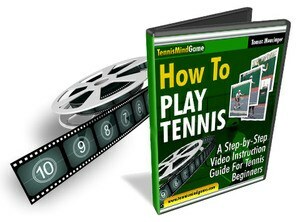 Their life is just starting, and their body is just starting to develop – which is why picking out their tennis shoes must be done carefully. 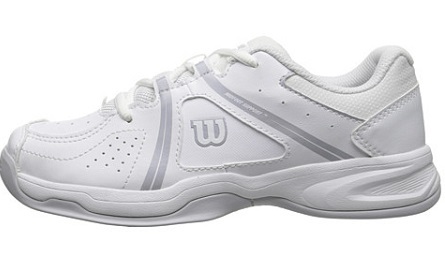 In this respect, we will review the Wilson Envy Junior tennis shoes and see how well they deliver for our little ones. 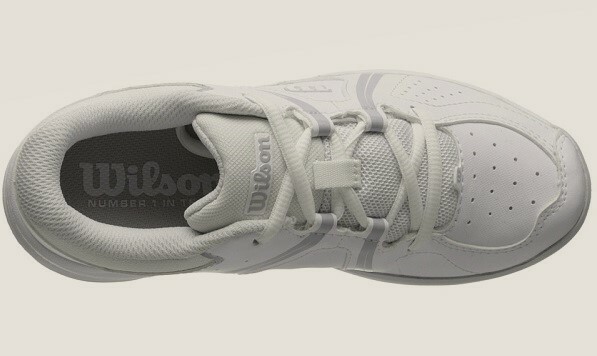 The Junior shoes from Wilson were made for professional players on the rise. When you are just starting out as a tennis player, especially at such a fragile age, you need a pair of shoes that will offer the ultimate support. This is why the Envy shoes are so attractive for many young players. With their R-DST plush cushioning, your child will experience great comfort and support, along with stability and responsiveness. The outsole is also fairly unique. With its Duralast base, these were made to withstand friction even on concrete courts – to last for as long as possible. Furthermore, the herringbone tread pattern was added to enhance your grip even on grass fields. 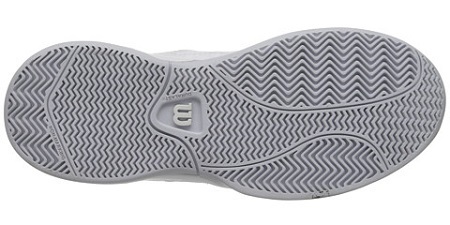 The Endofit midsole is also perfect for increasing the fit and comfort. The system will “hug” your foot, leaving no extra room. Your children will receive proper support as they are running – and the shoe will stay in its place. The exterior is made from synthetic leather which is easy to clean. The fabric has been treated for increased durability and traction, and therefore it can be used regardless of the season. It is also designed to be water resistant, so you can use the tennis shoes even if the weather is against you. For a starter, we were very impressed by the quality-price ratio. When a pair of shoes is this cheap, you usually start wondering: will they actually last enough to do their job? However, after they are worn for a couple of months, they still look like brand new. The neutral color palette of this tennis shoe is very convenient. You can pretty much match them with anything, and they do not stick out like a thorn in your eye. They are not made of cloth either, which makes them easy to maintain. All you will need is a damp cloth or some wet wipes, and you’ll be good to go. Breaking a pair of shoes in is usually the most troublesome part. Their quality is actually determined based on the speed of that process. And we can say that the Wilson shoes passed our test. Thanks to its very soft cushioning, they were very comfortable right away. Indeed, they needed a few days to properly settle around the foot, but there were no issues with blisters – which usually happens with new shoes. The sole is also perfect for any kind of court. 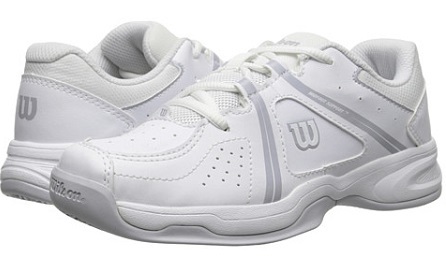 Since it’s very durable and cushioned, you can safely use them on a hard court. On the other hand, thanks to the herringbone pattern, you can play on clay courts and grass as well. You’ll have superior grip. Most people were impressed with their durability and the fact that they are all so cheap. They provide great support as the child is moving and running around, which is why a lot of people use them as running shoes as well. The ankle support is also superior, and they are as comfortable and good as they look. Out of all tennis shoes that we tried, these needed the least break-in – if any at all. The plush cushioning helps a lot in this aspect, and they also provide superior support. There weren’t many complaints about these tennis shoes, neither from us nor from the customers. One user mentioned how they wish they were easier to lace, as the child often struggles. Still, this is the issue with every tennis shoe. Also, we would have liked if there were more colors to choose from. The current color palette is very convenient when it comes to regulations and clothes matching, but it would have been nice if I had choices other than white, black, or grey. There are many websites from where you can buy these shoes, as well as many local stores. However, if you want to buy them cheap, you may want to try Amazon. Granted, the price differs depending on the model you choose: the “Little Kid” or “Big Kid” model. However, they’re still cheaper than in other stores. Plus, knowing Amazon, there are all the chances that you can get a pretty good discount, as well as free shipping – if you find the shoes at the right time. Overall, this is a very good pair of tennis shoes for your junior. As a parent, the last thing you’ll probably want is for your child to be in pain caused by blisters. However, thanks to the soft cushioning, these items will bring home the victory right away. If you are looking for a pair of decent shoes within an affordable budget, then the Wilson Envy ones should definitely be considered.